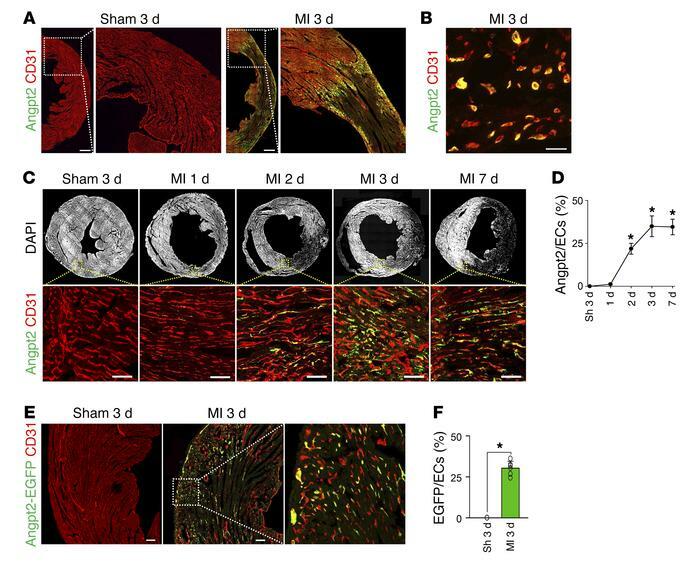 Angpt2 is highly expressed in ECs of the border zone after MI. Adult WT mice were subject to MI or sham procedure (Sh), hearts were harvested at indicated time points, and indicated molecules in heart sections were detected by immunostaining. (A and B) Images for Angpt2 in ECs at the infarct border. Scale bars: 500 μm (A); 20 μm (B). (C and D) Temporal changes of Angpt2 in border zone ECs at indicated day after MI. n = 6, each time point. Each box region is magnified below. Scale bars: 100 μm. *P < 0.05 versus sham, Mann-Whitney U test. (E and F) Images and comparisons of Angpt2 expression in ECs at the infarct border of Angpt2-EGFP mice. Box region is magnified at right. n = 5, each group. Scale bars: 100 μm. *P < 0.05 versus sham, Mann-Whitney U test. Error bars represent mean ± SD.